At home in ANY off-road condition, from deep mud to gravel roads, this tire delivers great street manners and a remarkably low noise level. The Road Venture MT is the perfect choice for the street bound 4x4 that wants the ultra aggressive look of an off-road tire with large rim diameters. Dual compound tread prevents heat buildup, blocks out impact and noise from the road surface. High tensile full width steel belts and jointless cap plies enhance durability and reduce noise. These tires look great on the Hummer. I have had alot of 4x4s and alot of different tires and so far these tires are one of the best that I have owned. These tires are great minimal problems & miminal noise. Great look & price. I would definately recommend these tires & will buy them again. 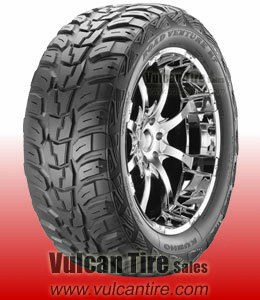 Vulcan tire is also a good spot to get them.